I always think of Nick Malgieri as a great baking teacher. Back when the Food Network aired only shows about how to cook, rather than so many cooking competitions, I used to love seeing Nick Malgieri appear on shows like Cooking Live with Sara Moulton. I always learned new things. Years ago, I also attended a fantastic class he taught here in Austin at Central Market Cooking School. His latest book, Nick Malgieri's Pastry , is an excellent guide for all sorts of pastries, and I received a review copy. There are clear instructions and photos for each step of the way, and he writes: “if you follow the simple instructions here, you’ll be able to tackle any pastry project you like.” I believe it. He guides the reader through several versions of dough and how to work with each, and then there are the recipes for using them. As I read through the chapters with tarts and pies, I made mental notes for upcoming holidays. The orange and almond tart is a beauty for New Year’s when citrus season is in full swing, the Sour Cherry Tart with Almond Meringue would be festive for Christmas with jarred sour cherries, and for Thanksgiving I can’t decide between the Cranberry Pecan Pie and the Old-Fashioned Sweet Potato Pie. I’m also fixated on the “French” Apple Pie which is a double-crust pie baked in an eight-inch round pan with straight sides, filled with cooked chopped apples and raisins, and it’s topped with a confectioners’ sugar glaze. I’ve never seen a pie like this, and I have to try it. Beyond the tarts and pies, there are strudels both sweet and savory, baklava and yufka recipes, puff pastries, yeasted doughs, and pate a choux. The Pear and Almond Dumplings made with puff pastry are on my to-try list, and so are the Coffee-Filled Cream Puffs. Before I dive into the gorgeous dessert options, I wanted to try the savory empanadas. In the book, they’re called Argentine Christmas Eve Empanadas because their spinach and anchovy filling make them appropriate for the day before Christmas. They’re made with Sour Cream Dough which was a delight to work with. As promised, following the simple instructions produced a perfect dough for the empanadas. Flour and salt were combined in a food processor, and pieces of butter were added and pulsed. Sour cream was spread around on the surface of the flour-butter mixture so it would mix in more easily. A few pulses later, the dough was ready. It was shaped into a disk and chilled for a few hours. Meanwhile, I started on the filling. I used a mix of fresh spinach and Swiss chard. Lots of scallions were chopped, garlic was minced, and anchovies were finely chopped. Oil was heated in a large saute pan, and the scallions were added followed by the garlic and anchovies. I added the spinach and chard directly to the scallion mixture without pre-cooking. It was seasoned with salt and pepper and smoked paprika. Parsley was added last. I tipped the pan to the side and let the moisture run away from the spinach and chard before removing it to a bowl to cool. After the dough had chilled, I divided it into eight pieces and rolled each into a round. The sour cream made it especially tender and easy to roll. I stacked the rounds between pieces of parchment, covered the stack with plastic wrap, and chilled them overnight. 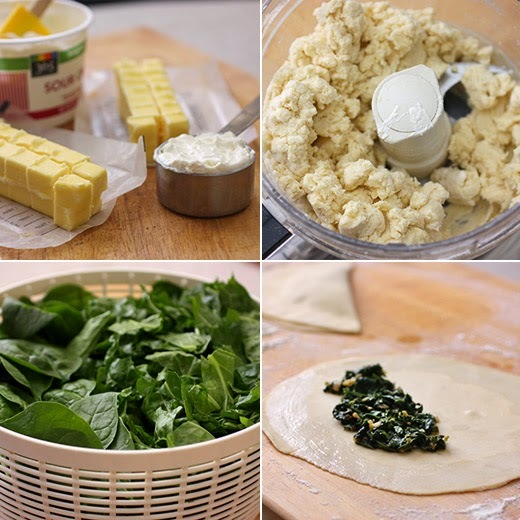 The next day, I filled each dough round with some of the spinach and chard mixture and shaped the empanadas. They were brushed with an egg wash and baked for about 25 minutes. The dough was incredibly easy to roll and resulted in that perfectly fragile, shatteringly crisp texture just like it should. The filling was savory and flavorful with the scallions and anchovies. I was thrilled with the result and can’t wait to try more things from the book. And, I’m already ready to start baking for Thanksgiving. I predict several dessert options on the table this year. Recipe reprinted with publisher's permission from Nick Malgieri's Pastry . These spinach empanadas make a delicious alternative to the typical meat-laden ones and are traditionally eaten on Christmas Eve, a day of abstinence from meat in Catholic countries. These are usually deep-fried, but I decided to bake them—it’s easier, and they turn out much less rich. 1. Put the fresh spinach with the rinse water still clinging to it in a large Dutch oven with a lid. Place over medium heat, cover, and steam for a few minutes until it reduces in volume. Uncover and, stirring occasionally, cook for 1 to 2 minutes longer. Drain, cool, and chop the spinach. 2. Put the oil and scallions into a large saucepan over medium heat. Once the scallions start to sizzle, lower the heat and cook slowly, stirring often, until tender, about 5 minutes. Stir in the garlic and cook for a few seconds. Stir in the chopped spinach and anchovies; cook for a minute or two. If using frozen spinach, cook a couple of minutes longer at this point. 3. Taste the spinach and season with salt and pepper. Stir in the parsley and paprika. Cool the filling. 4. While the filling is cooling, divide the dough into 80-gram pieces and shape each into a flat disk. Roll each piece of dough into an 8-inch disk and chill if you’re not going to assemble the empanadas immediately. 5. Arrange the disks of dough on the work surface and brush the edges with water. Divide the filling equally among the dough rounds, mounding it in the center of each one. Fold the dough over to make a fat half-moon-shaped pastry. 6. Press the edges of the pastry together with a fingertip, then fold and overlap the edge of the dough to seal the empanadas. 7. Chill the empanadas, loosely covered with plastic wrap, until you’re ready to bake them, up to 24 hours. When you’re ready to bake, set a rack in the lower third of the oven and preheat to 400°F. 8. Arrange the empanadas on a cookie sheet lined with parchment and brush them with the egg wash, making sure not to let puddles accumulate on or under the empanadas. Place the pan in the oven, lower the temperature to 375°F, and bake until deep golden, 20 to 25 minutes. 9. Cool the empanadas briefly on the pan on a rack and serve warm. My dear late friend Sheri Portwood ran a Dallas catering business for years and was constantly trying to perfect her recipe for rugelach, which uses this dough. I’ve included recipes for rugelach in several other books, but I love this dough as the top of a deep-dish savory pie, a cobbler (especially when it’s cut into separate overlapping disks for the top crust), or for any top-crust-only pie. It’s flaky, extremely tender, and delicate, almost like puff pastry. A food processor does the best job of mixing this. 1. Combine the flour and salt in the bowl of a food processor and pulse several times at 1-second intervals to mix. 2. Add the butter and pulse until it's finely mixed into the flour and no visible pieces remain. 3. Spread the sour cream all over on the top of the flour and butter mixture (rather than adding it all in one spot). Pulse 3 or 4 times; if the dough is already starting to form a ball, stop pulsing; if not, pulse a few more times but don’t overmix or the flaky quality of the dough will be lost. 4. Invert the dough onto a lightly floured work surface. Shape into a disk and wrap in plastic. 5. Chill the dough for 2 to 3 hours or overnight before using. Makes enough for the top crust of a large savory pie or sweet cobbler or 8 empanadas. Mouthwatering! Those are wonderful empanadas. Thanks for all your kind words, Lisa. So glad that you chose these empanadas - I love them. Your empanadas look so good! Such a sultry ode to pastry made easy and scrumptious! A very tempting fall recipe! These empanadas look really super. I must give this sour cream dough a try soon. I've eaten empanadas in Argentina, but filled with meat, never with vegetables. I can't wait to try these. They look delicious. 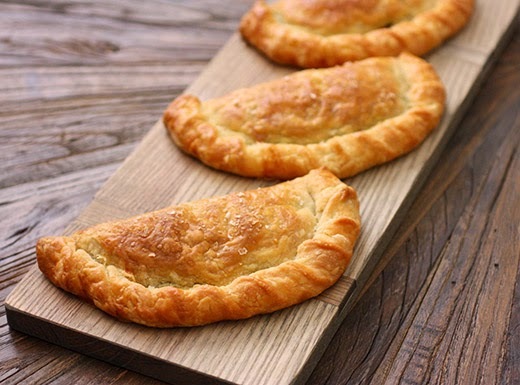 Your empanadas look lovely, the golden colour with a delicious stuffing is so tempting! Lisa, I'm so happy that you sharing this empanada recipe. I always take something as an appetizer to a friends house for Thanksgiving with a large group …these will be prefect. The crust on your empanadas is just perfect. Sounds like a great book, will have to get my hands on one. Yum, these look divine! Just love that golden yellow crust - it's making the sandwich I'm eating look very dull! while my family would probably turn up their noses at something like this on christmas eve, i'd like it very much. that crust looks amazing! That's a really nice dough! And I love the idea of dark greens in empanadas. Definitely putting this on my list of stuff to make (my long, long list!). Really like this -- thanks. 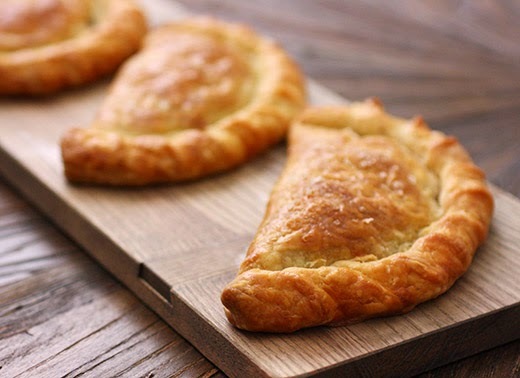 Those are the most perfect looking empanadas I've ever seen. Especially love the way you did the edges. I bet they taste even better than they look, too. No way! These look marvelous! I love the crust and the filling... I'm mouthwatering so much! Have a great day, Lisa.